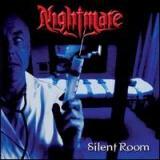 The French metal band Nightmare has been pretty active since their 15 year hiatus between 1984 to 1999. Silent Room is their fifth studio effort overall. It is also a concept album and whenever any band is attempting that, there is either a stupendous triumph or a total crash landing ahead. Sad to say, Silent Room does not work very well with me. It is about a boy who is severely addicted to computer games. He somehow gets sucked into the game or some kind of network. Once there, he kills somebody. But suddenly the borders of the game-like world and reality start to twist and he is not so sure if the crime he committed was so fictious after all. Also a kind of “coming-of-age” story from a boy to a man is linked to this plot, I didn’t quite get this one. If anyone feels I have mistaken and would like to elaborate, feel free to do so. For any Sherlock Holmes´ out there, this might be a buy for you for the story alone, which didnt open to me that well. As for the music, almost every spot here fills the characteristics of “its ok, its just been done a whole lot better many times earlier” type of rocking. Jo Amores voice can handle the average power metal singing pretty well, but he sounds pretty strained on the highest notes. The kind of joyful, soaring crooning a la Tobias Sammet is a long way from this. The guitar work of Hilbert and De Dominicis is the biggest bright side on this album. Partially very melodic and stylish licks and riffs abound every here and there. But one of the essential qualities of a concept album, a strong and unified entirety, is not among the successful qualities here. As a whole the album doesn’t stay together well enough for the story to keep its interest even to the middle of the record. The faster double-bass powered songs Virtual Freedom and The Death Toll are the best tracks on the record, but the songs that could be described as good as a whole end there for me. Nice melodies and some good parts come out here and there, but as a complete package the songs don’t work for me. Very little seems that memorable here. The production on this album has its flaws too. I can barely hear any bass going on and the mix could have used a lot more chunkiness and “shakingpower”. With music that has choirs and gothic-like keyboards trying to create a grandiose atmosphere, the production must support the music. But such is not the case with Silent Room. On many tracks the drums also seem to get buried under everything else, which does not hit my ear so well. These veterans have been hard at work trying to create a grand concept record but to me, this falls down by the waistline. If a bit gothic-flavoured power metal is your piece of pie, you might like this more than me. I guess one could at times praise this as a poor mans version of Operation Mindcrime, but most of the time we would be talking about a real gutter-beggar. But as you can see from below, many other sources have disagreed greatly in points with me on this one, so give it shot at the store, its not that impossible that you will feel completely different than me.